ElectroMag is a small CUDA demo that displays static electric field lines generated from a static distribution of charges. It uses all available GPUs in the system to display the electric field with lines using OpenGL. This demo requires a CUDA-capable GPU with at least a 1.1 compute capability. So if you have a GeForce 8800 GTX / 8800 GTS you won’t be able to start the application because 8800 GTX/GTS have a compute capability of 1.0. I tested this demo with a GeForce GTS 250 / ForceWare 185.85 at around 59 FPS. Demo’s source code is available via svn. 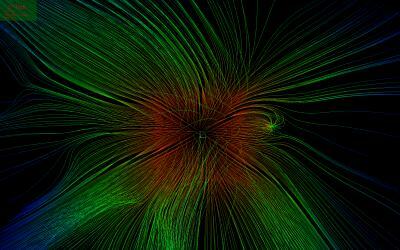 Okay, electric field is cool, but magnetic field? And why not an interactive visualization of Maxwell’s equations?